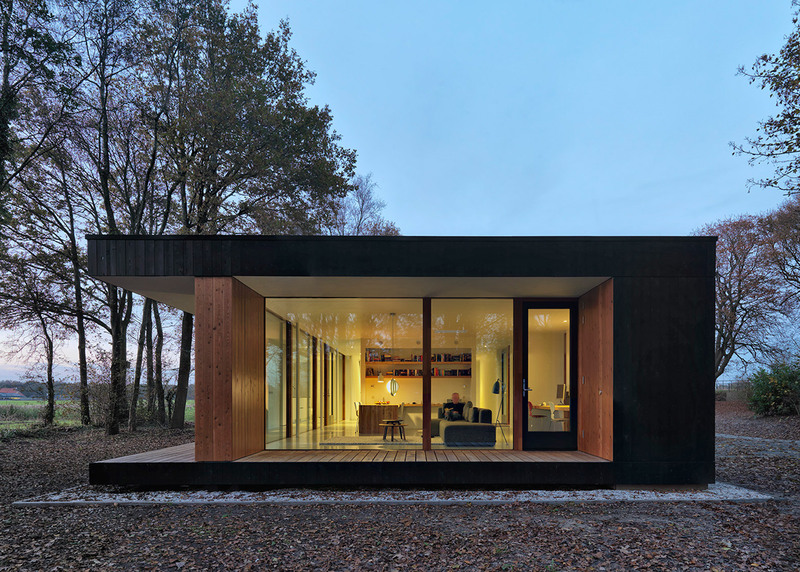 This glass and timber house by Dutch office DP6 Architectuurstudio was designed "like a little black box" with sections of dark larch cladding to help it merge with the surrounding trees. Makkinga House was designed by Delft-based office DP6 Architectuurstudio on a rural wooded site overlooking a river in the northern Dutch province of Friesland. The owners asked for a small single-storey home to replace a more traditional pitched-roof house on the site, which had little connection with the setting. "The old house appeared to be oblivious to its exquisite context, offering just a single small window to view the magnificent landscape through, as well as an almost-hidden entrance, and rooms that were cramped, cold and draughty," said architect Richelle de Jong. The new rectangular house features glazed facades on the south and west sides to open up to views of the surrounding trees and river. Small windows offer privacy and minimise heat loss on the north and east sides that face an adjacent road. "The house is very different to the regular houses in the neighbourhood, which are mostly made of stone, and have small windows and a pitched roof," de Jong told Dezeen. "We tried to make a house that's more than that, fitting in with the landscape like a little black box." The 120-square-metre house is approximately the same size as the previous home, and has an open-plan layout to maximise the sense of space. One side has a living and dining area, and the other accommodates a master bedroom and smaller bedroom. These are arranged around a central core housing the kitchen, bathroom and toilet. A terrace stretches across the west facade and features a wide overhang, which is designed to shield rooms inside from harsh light in summer, when the sun is higher. It still lets in direct light during autumn and winter, when the sun is lower. "The brief called for sunlight, sustainability, comfort, and a dialogue with the landscape," said de Jong. "In addition to the wide overhang, the trees also help to filter daylight coming into the house." The glazing on the south and west sides is 2.6 metres tall. The frames have been concealed at the top and bottom so that the floor and ceiling appear to flow outside, uninterrupted, to the terraces. "The house is designed and detailed like a piece of furniture, with walls, floors and ceilings that continue outside," said de Jong. "We wanted to make the view as wide as possible, and make the glass feel like it is almost non-existent." Other homes designed to embrace wooded settings include a basalt-clad lakeside cabin in Norway and a house covered in white corrugated metal in Princeton, New Jersey, with windows that frame specific views of the landscape. On the north side of Makkinga House, there is a garage and a storage room that are separated from the main home by a covered walkway. "We separated this section from the house to create a passage that you can see the landscape through, from one side to the other," said de Jong. The garage was built with timber, while the main house was constructed with concrete floors and limestone walls. These have been clad in raw and blackened larch. Construction was completed in seven months. "The project involved consistent collaboration with the owners to create a house like a fitted coat, appropriate to their precise needs," said de Jong. "The optimised orientation, combined with triple glazing, a well-insulated building shell and draught-proof details, has created a highly energy-efficient and comfortable house," she added. Photography is by Michel Kievits.